Figure 2 Radiological anatomy of the human cerebellum. Magnetic resonance image (T1 weighted) of the human brain and of the cerebellum. Upper part: medial view of the brain. White lines indicate planes of sectioning. ABC: coronal VIEW of the cerebellum; CDE: axial VIEW of the cerebellum. Courtesy of Dr. Francesco Tomaiuolo, Clinical and Behavioral Neurology Lab, IRCCS S. Lucia, Rome. Figure 3 Schematic view of the human cerebellum. (Left) Nomenclature derived from comparative studies. (Right) Nomenclature used in the clinical literature. The Roman numerals indicate the vermal subdivision according to Larsell. prefix H to the Roman numerals. The cerebellum covers the fourth ventricle and is attached to the brain stem by three pairs of fiber bundles—the inferior, median, and superior cerebellar peduncles. At the cellular level, the cerebellar cortex is extremely homogeneous in its organization. The intrinsic circuitry is based mainly on five types of neurons organized in three layers: the granular layer, in which granule cells are present, is closest to the white matter; the Purkinje cell layer is the intermediate one and is formed by a single line of Purkinje cells; and the molecular layer is the most external one, in which, beside the dendrites of the Purkinje cells and the parallel fibers of the granule cells, three types of interneurons are present (i.e., the Golgi, stellate, and basket cells). Granule cells are the only excitatory neurons of the cerebellar cortex and represent by far the largest population of neurons in the cerebellum and possibly the whole brain. The short claw-like dendrites of each granule cell receive many terminals from many different mossy fibers; each terminal forms a complex synaptic arrangement, the glomerulus, in which a terminal from a Golgi axon also participates. The mossy fiber system is the main afferent system. It conveys all information reaching the cerebellum except for that originating from the inferior olives, which reaches the cerebellum through the climbing fibers. These latter fibers terminate directly on the proximal smooth branches of the Purkinje cells. Each Purkinje cell receives only a single climbing afferent, but each climbing fiber contacts up to 10 Purkinje cells. Purkinje cells present a dendritic tree that is relatively smooth in the basilar part but is full of spines in the distal part where terminals from many parallel fibers are present. 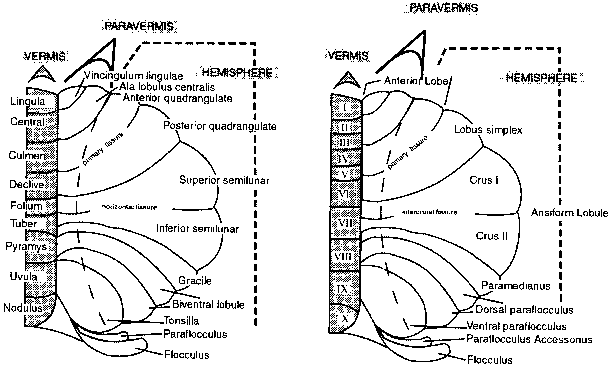 The general branching of the Purkinje cell dendritic tree is flattened, with its main axis perpendicular to the main axis of the parallel fibers. This arrangement allows each Purkinje cell to be contacted by many different parallel fibers. Each fiber makes very few synapses over the same Purkinje cell but contacts many different ones. The axon of the Purkinje cells is the only way out of the cerebellar cortex and provides a powerful inhibitory control over the deep cerebellar nuclei and some vestibular nuclei. Whereas the stellate and the basket cells provide a feed-forward inhibition over the Purkinje cells, the axons of the Golgi cells synapse over the incoming mossy fibers providing a powerful inhibitory feedbackward control over the granule cells. Although all three types of interneurons are GABAergic, only the Golgi cells also colocalize glycine. Recently, a new type of cerebellar interneuron not expressing GABA or glycine was identified—the unipolar brush cell. These cells are located in the granular layer; they receive massive input from a single mossy fiber and their axons contact granule and Golgi cells. Their distribution is not uniform throughout the cerebellar cortex and their function is still a matter of debate. Another cell type recently characterized is that formed by the cells located just under the Purkinje cell layer: the Lugaro cells. These cells present their major cell and dendritic axes parallel to the Purkinje cell layer; they are inhibitory interneurons and their function must still be clarified. Besides mossy and climbing fibers, a third, often neglected, afferent system has been known since the late 1960s. 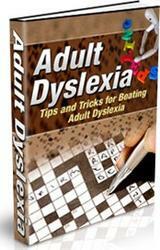 It is formed by beaded fibers that terminate throughout the cortical layers. This system is considered to play a modulatory role on the activity of the cortical circuits. These fibers originate from different extracerebellar sources of known modulatory function, such as locus ceruleus, raphe nuclei, or brain stem cholinergic cells, and from different nuclei of the hypothalamus. On their way to the cerebellum, mossy fibers as well as climbing fibers give off collaterals for the deep cerebellar nuclei from which all the cerebellar output fibers originate. On their way to extracerebellar targets, deep cerebellar nuclei axons give off collaterals that contact granule cells or the neurons that give off mossy fibers in precerebellar nuclei. In addition to excitatory projecting neurons, deep cerebellar nuclei also contain small GABAergic cells that project to the inferior olive. The general schema of the cerebellar circuitry is shown in Fig. 4. 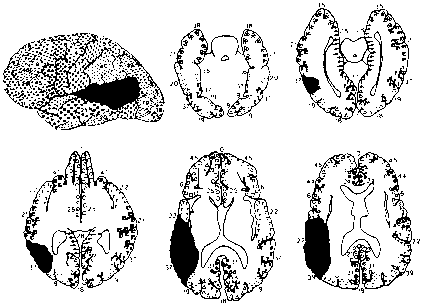 The strong anatomical and functional interrelationships between the deep cerebellar nuclei and the cerebellar cortex were clearly defined by Masao Ito, who proposed the term corticonuclear microcomplex (Fig. 5) to describe the basic functional mode of the cerebellum. Parallel longitudinal zones can be identified in the cerebellar cortex on the basis of output organization and differences in the expression of certain proteins by subpopulations of Purkinje cells. These microzones are perpendicular to the main axis of the folia and they extend across one or more lobules, some of them spanning the entire rostrocaudal length of the cerebellum. 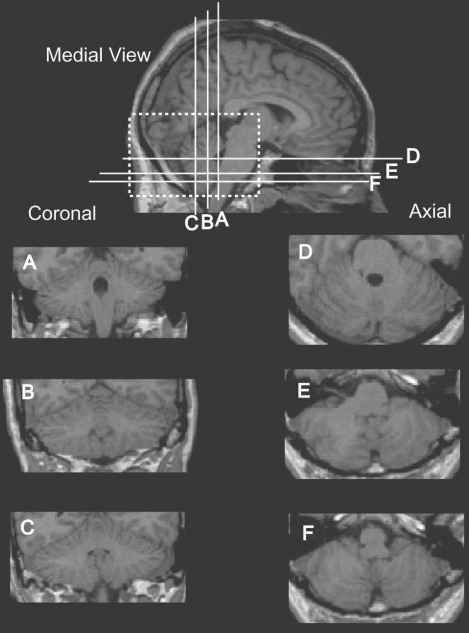 These zones were identified and numbered and their connectivity was fully determined, demonstrating that this pattern is preserved in the corticonuclear projections as well as in the olivocerebellar ones. Therefore, each longitudinal zone projects to a specific sector of the deep nuclei and receives the same input from the inferior olive. This basic schema is repeated through the mediolateral extent of the cerebellum and can be identified as the basic functional module of the cerebellum (Fig. 6). The organization of the mossy fiber input is more complex and its relation to the microcomplex organization is still uncertain. Different brain stem and spinal centers project to the cerebellum through the mossy fiber system, terminating in lobule-specific patterns with a roughly preserved somatoto-pical pattern with the hindlimb located ventrally and face and forelimb located more rostrally in both anterior and posterior lobules. Within this general arrangement, the finer somatotopy is "fractured," as shown by Wally Welker in 1987, without preservation of the precise topographical relation between adjacent receptive fields (Fig. 7). What are the subdivision of the cerebellum?